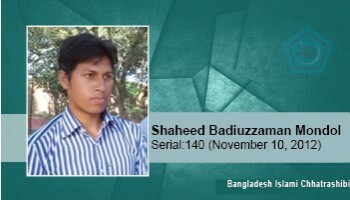 On November 10, 2012, after being attacked by police at the procession for the release of the leaders, he attained martyred while under treatment at the Islami Bank Central Hospital. He was a meritorious student of Nurul Huda Kamil Madrasa Fazil 3rd year. The younger of the five children of Shibir Md. Badiuzzaman Mondal, father of late Abbas Ali Mondal and mother Khobel Begum. He was born in the well-known Muslim family of Telirhar village of Amadei union of Panchbibi upazila of Joypurhat district.